Produced by Sheldrake Astronautics for NASA an all da res uh ya, unsolicited, under no contract, and with no other incentive than to cut down on the number of times I have to answer common questions on the how and why of "that pattern", and where it comes from. First, let's recognize that this is so simple, it's hardly worth describing. Take a look, and you get it. It is obvious. But the human convention is to swaddle the precious but obvious with words - to tease out and enumerate every detail, to compose a narrative of creation and authorship, and, most importantly, to give a name upon which to hang all these conceptual baubles. Call it the Quarter Isogrid. It is not isogrid. Neither is it honeycomb. But as a structural pattern, it is expected to have properties similar to these other patterns. 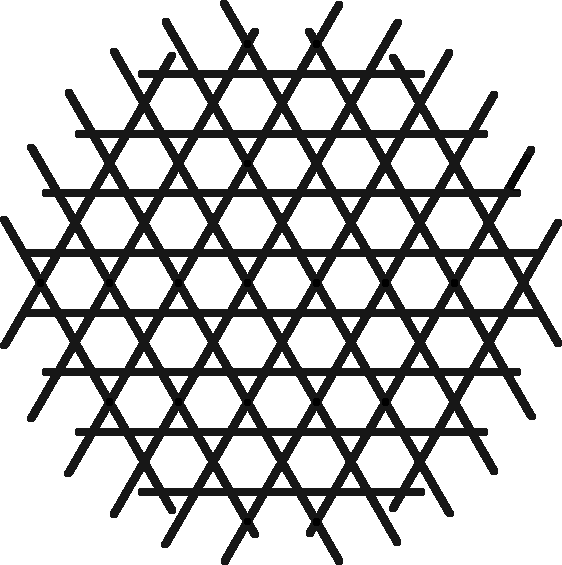 So "isogrid" is included in the name to suggest this kinship and imply that the pattern may be used in similar ways. 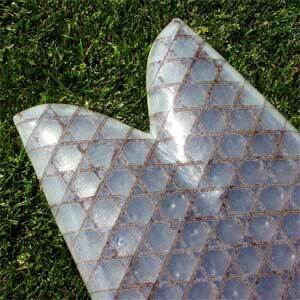 More people seem to be familiar with honeycomb than isogrid. Should we call the pattern a "triangle-supplemented honeycomb"? No - this is not honeycomb. It IS a subset of the triangles that make up the isogrid pattern, if you consider that pattern as rows of triangles. When you keep just one triangle out of every four in each row of the isogrid pattern what else do you have but a "quarter isogrid"? In the 1960s, a few people at an "astronautics" company were trying to help NASA come up with a better approach to making strong, lightweight rib-and-skin structures for rocket nose cones, pressurized fuel chamber bulkheads, and other space-age structures like that. They came up with an all-triangle grid - initially by triangulating the square rib patterns they had been using previously. A report summarizing these efforts states, "The new structure is called 'Isogrid' since it acts like an isotropic material". You can read an early seventies roundup of isogrid work in NASA's Isogrid Design Handbook (PDF, 8 MB). Though we know the quarter isogrid is rad just by looking at it, let's revel in its radness a bit more by considering an application of this pattern where it out-performs it's closest rivals. Consider the notched rib assembly. It is most familiar to us in a square or rectangle pattern, where ribs meet at 90 degree angles and fit together with notches. 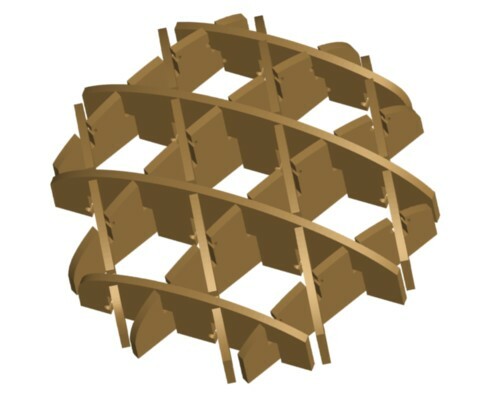 Example of notched rib assembly using a rectangular pattern, where the edges of the ribs trace out the surface of a curved 3D shape. The edges of the assembled ribs may conform to the surface contours of a 3D object, yet each rib before assembly is practically a 2D object. Designing notched rib assemblies allows us to use 2D cutting tools to create 3D objects. Two-dimensional part production can be much cheaper than 3D production. If you've got software to figure out all the cross section cut patterns, you can easily create some pretty complex 3D structures using the notched rib assembly approach. 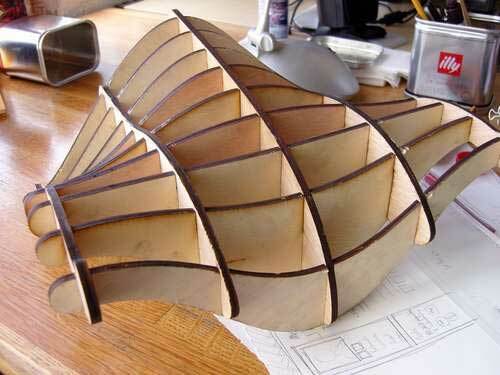 Now consider what other patterns might work for a notched rib assembly. Honeycomb? Nope. There are no continuous straight lines through the honeycomb pattern to follow while taking cross sections of a 3D object. Conventional isogrid? Maybe. You can do it, but consider the notch situation. In the conventional isogrid, three ribs meet at each intersection, so more of each rib's height is cut away to accommodate the others. The quarter isogrid pattern works very well for a notched rib assembly. Square grid assemblies have nice simple two-rib intersections, but the 90 degree intersection angles make the structure more susceptible to collapse, especially when ribs are composed of a thin or flexible material. Conventional isogrid assemblies would be triangulated, and so self-stable, but their ribs meet three at a time, compromising the strength of the rib material at these deeper notches. The quarter isogrid pattern has the simple two-rib intersections and shallower notches of the square pattern, and the self-stable triangulation of the conventional isogrid. Quarter Isogrid - Where Have You Been All My Life? Why don't we see more of the quarter isogrid - or why don't we see it at all? Have you ever seen this pattern used for physical structures? I found a couple widespread examples: classic Vans tennis shoe soles and some weaving patterns. Neither is really what I had in mind as a good structural use, but that's all I could find. Aerospace engineers tell me they haven't seen this pattern in use in their industry. A guy from NASA recently asked me where I got this design. Well, it's there to be had, if you need it. Same goes for the conventional isogrid. These are patterns the human mind is prone to develop when needed. I'm sure it's been devised and used many times, even if examples are not readily found. It's too simple to claim as an invention. It's no big deal. Like I said, I'm sure the quarter isogrid has been thought up and used numerous times. 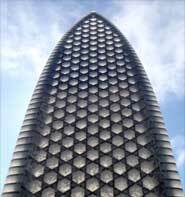 If you know of an example of a structural use of the pattern, send me a photo or reference. I'll hang it in the prior art gallery. Following is a brief account of my technique for independently rediscovering the utility of basic geometric patterns. This new strategy for technological innovation is called "Loaf and Doodle". Loaf and Doodle enjoys tacit "best practice" status industry-wide. I was trying to design a rib structure for a hollow surfboard. 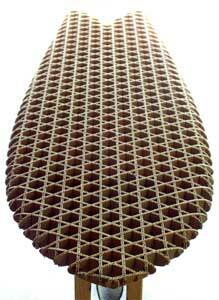 Conventional hollow wooden surfboards and paddleboards use a rib and stringer approach, with 90 degree intersections. I needed a ribbed core structure that could hold it's shape well before any kind of skin was applied. I knew it would be better to introduce some stabilizing triangles, or better yet, design the whole thing out of triangles. I headed out to a favorite café (to loaf) with a dollar-fifty coffee budget and a sketchbook (to doodle). Once you see it you get it - and then you want to use it. If you've recently used the quarter isogrid in a project, send me a photo for the contemporary art gallery. What's a triangle but three lines? Well how about three sets of parallel lines? Let's scribble out some sets of parallel lines. Ooh, they probably shouldn't intersect more than two at a time, if I can help it. Let's sketch that again a little more carefully. Oh. (eureka, ah-ha, by golly, well I'll be..., holy moly, etc.) That will work. I see here that if three sets of lines are all rotated 120 degrees from each other, and one set is shifted just so, I get all these triangles and hexagons - and obviously this pattern would be self-stable as a structure, amenable to the kind of notched rib assembly I was thinking of, and all these straight pattern lines can serve as paths for side-to-side or lengthwise cross sections of my 3D surfboard shape. Why didn't this occur to me sooner? That's a verbose approximation of the process. Nothing special, right? It's silly to describe, but this is the answer to the "how did you come up with this pattern" question people often ask. Did we tell the story? What is it? A certain arrangement of triangles and hexagons useful as a structural pattern. What is it called? "QUARTER ISOGRID" (snicker snicker). Who shall we credit with its invention? If you recognize it's utility, you might as well credit yourself - and everyone else who gets it. When did it come into being? At the dawn of human intelligence, and every time it's needed.